“The 36th Holistic Nursing Conference” was held by the American Holistic Nurses Association (hereafter AHNA) in Bonita Springs, Florida, USA, from May 31st through June 5th, 2016. AHNA, “founded in 1981, is a non-profit membership organization, consisting of nurses and other medical professionals, that promotes the education of nurses, other healthcare professionals and the public in all aspects of holistic caring and healing.” (from AHNA website) It has grown to be a considerable association with its members still increasing both in the U.S. and overseas, with more than 4500 members and 130 chapters. This year marks AHNA’s 36th anniversary and its “Global Holistic Care Conference,” a large-scale international conference, the “Holistic Care Summit,” so to speak, will take place 2 years from now in 2018 in Niagara Falls, NY. AHNA invited nurses from overseas: one from Canada, two from China, one from the Bahamas, and five from Japan, to introduce us to its theoretical concepts, practices and research that embrace AHNA’s global vision and mission in Holistic Nursing/Care. In addition to conventional presentations on various Holistic Nursing activities, the conference also included poster and research presentations, and workshops, which we found to be extremely innovative environments where one can both “learn” and “experience” in diverse forms. Its weeklong conference came as a surprise to us Japanese, but we were astonished by the daily schedule, which depending on the day, was a full day program packed with various presentations and events, starting at 6:45 a.m. and ending at 11:15 p.m. Moreover, the conference was not limited only to nursing, but included optional activities (with a fee), such as a dolphin watch cruise, leading to our impression of the conference as embodying “healing” in practice for participants to experience. Venders at the conference were also numerous and diverse, which we also felt contributed to the creative ambience of the conference that was not only a “place for us to learn,” but for each of us to visualize various possibilities about how we can implement ‘healing’ into practice of Holistic Nursing. The utmost benefit for all overseas nurses to attend an AHNA conference is to actually experience and see the nurses who are committed to and practicing Holistic Nursing! Dr. Drick’s remarks made us visualize ourselves as a tree: A tree without foundation/roots firmly grounded, no matter how hard it tries to grow branches, may not be able to stand securely, strong and tall. Only firmly expanded roots allow the tree to grow its trunk and branches and leaves, enabling it to shelter people from rain or to filter beautiful sunlight through its branches and leaves to benefit others. The beauty of Holistic Nursing might originate in the fact that only those who can take care of, reflect on and establish, “oneself,” can just like a “large, great tree,” truly “heal” many others. Nursing schools in Japan currently teach “zenjin-teki kango” or the “care that sees a patient as a whole,” namely, the care that assesses and attends to “all of the physical, mental, social and spiritual pain,” which corresponds to the view of Holistic Nursing. Not merely focusing on the physical, such education emphasizes the healing of a “whole person”: the entirety of the body, mind and spirit, as true care. Health Care, after all, may not only depend on “progress in science,” but all – including plants, animals, such natural environments as wind, rain, or climate – contributes to “care” as all is related and interdependent. One of the appeals of Holistic Nursing might come from embracing all, thus, this interconnectedness of all. 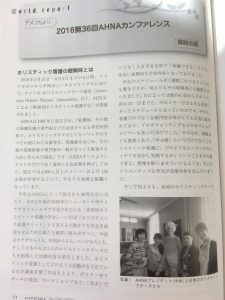 As part of its endeavor in globalizing Holistic Nursing, the AHNA invited, from Japan among other four countries, Rumi Naka the Board Chair of International Healing Association of Nurses (hereafter IHAN): a NPO organization, which has been working on promoting Holistic Nursing in Japan. The Opening Ceremony took place in the Grand Hall (which housed about five hundred attendants) of Hyatt Regency Coconut Point Resort Hotel, which overlooked the oceans of Bonita Springs, Florida. Holistic nurses invited from overseas also spoke after the introduction by Dr. Carol Ann Drick, President of AHNA. Rumi Naka, Board Chair of IHAN, stated as follows, representing Holistic nurses in Japan: “I believe that the Earth is One without boarder. I truly wish that in the near future Holistic nurses in both U.S. and Japan can work together in promoting Holistic Nursing.” Her remarks directly refer to “Interconnectedness” the theme of the conference this year. The world now faces various challenges. 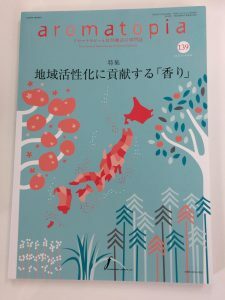 Japan might not immediately be able to relate themselves to numerous problems they hear via internet or TV, such as terrorism, Middle Eastern conflicts, tragedies occurring to women, global climate changes and collapsing economies, etc. As Holistic nurses, however, we ought not overlook such social or world issues especially because AHNA defines Holistic Nursing as “all nursing practice that has healing the whole person as its goal. [Its] practice recognizes the totality of the human being – the interconnectedness of body, mind, emotion, spirit, social/cultural, relationship, context, and environment.” (American Holistic Nurses’ Association, 1998, Description of Holistic Nursing). To create a world that “is One with no boundary,” like the one in Ms. Naka’s greeting remarks, Holistic Nursing must be at the forefront. This, indeed, deeply regards “Interconnectedness” the theme or the conference. 3. Meeting A Japanese Nurse who has been playing an active role as Holistic Nurse in the U.S.
At this conference we met Ms. Toyoko Yasui who has been working as Holistic Nurse at a New York hospital. Ms. Yasui, licensed as Registered Nurse in both the U.S. and Japan, has been working as a nurse for more than 25 years (she was a clinical nurse for about six years in Japan). She has a Bachelor of Science in nursing degree from Indiana University and received a Master of Science degree from College of New Rochelle in NY, specialized in Holistic Nursing, while having worked as Oncology nurse. Ms. Yasui is board certified in Advanced Holistic Nursing, Oncology Nursing, and Clinical Aromatherapy and, since 2014, has been playing a major role as Holistic Nurse Coordinator in offering Holistic Care in White Plains Hospital. While providing patients and their families with Holistic care/modalities as part of Palliative Care and Pain and Stress Management, Ms. Yasui also offers both nursing and hospital staff meditation classes and stress management workshops. She has also taught her “Ikebana (Japanese Flower Arrangement) as Mediation” class both in the hospital and at other institutions/organizations. Nursing education in Japan seldom provides workshops or systems which offer nurses an opportunity for self-reflection to prevent burnout. However, it is intriguing to find that learning Holistic Nursing can not only foster self-awareness but also self-healing and self-care, thereby preventing burnout. This may result from the fact that Holistic concepts that have roots in “Interconnectedness” (the conference theme this year) promote “mutual relationship” in which the healer would also become the healee. We highly recommend to those who aspire to be Holistic nurse to attend an AHNA conference in the U.S. and/or meet Holistic nurses from overseas, which will also inform you of the increased demands for Holistic Care/Nursing. Copyright © 2015 IHAN All Rights Reserved.